Best MKV Converter helps you to convert MKV to MP4 without losing quality easily. 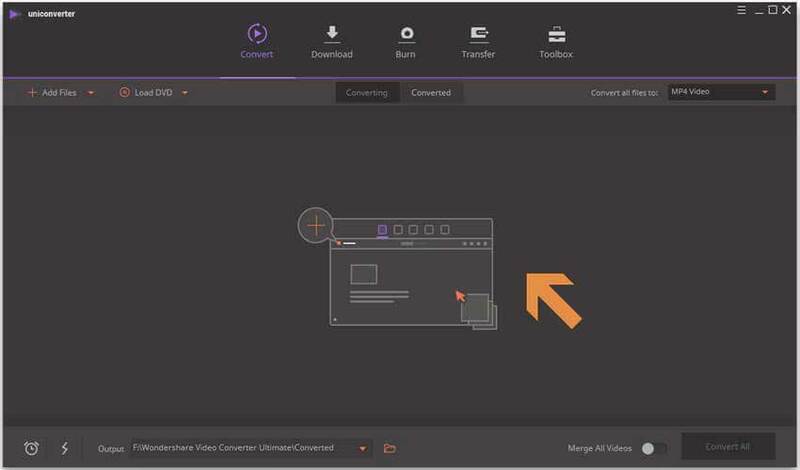 There're countless video converter software available for MKV to MP4 conversion in the market, but honestly speaking, Wondershare UniConverter (originally Wondershare Video Converter Ultimate) is worthy of the best MKV to MP4 converter tool. 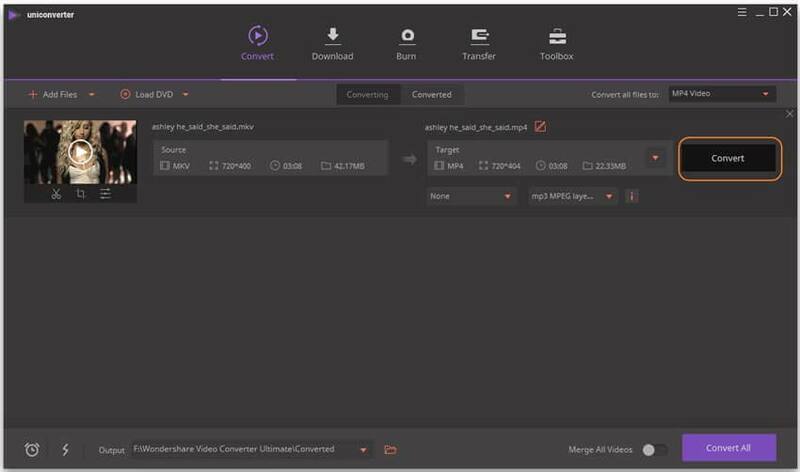 With simple interface, batch processing, customizable output formats, etc., Wondershare MKV to MP4 converter meets all your needs of converting .mkv to .mp4. Convert MKV to MP4, MOV, AVI and 1000+ formats. Batch convert video/audio files in original quality. 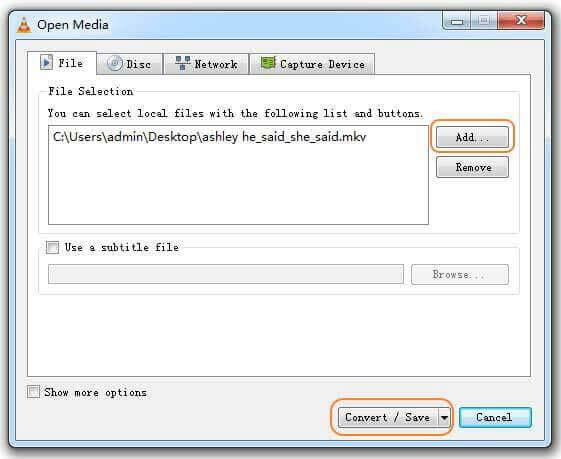 Batch convert multiple media files without limits. 30X faster conversion speed than any competitors. Supported OS: Windows 10/8/7, Mac OS X 10.14 (Mojave) -10.06. Although MKV is a popular format for high-quality movies and TV episodes, it's not widely-supported by modern devices. That case, we need to find a way to convert MKV file to MP4. Run Wondershare MKV to MP4 converter, click and you'll get a poo-up windows, select MKV video you want to convert in MP4 and click Open to load .mkv file. Hit from the Target section, go to Video tab > MP4 and choose Same as resource, which ensures you to convert MKV to MP4 without losing quality. Click Convert to start changing MKV to MP4 format. Once the MKV to MP4 conversion completes, you can switch to Converted tab to get the converted .mp4 video in original resolution. If you have loads of MKV video for MP4 conversion, you can follow the steps below to batch convert MKV to MP4. Launch the program, you'll get the primary interface under Convert section by default. Then directly drag and drop multiple MKV files to the best MKV to MP4 converter. Click beside Convert all files to:, choose MP4 under Video tab and select your desired quality in the right. Then you'd find all loaded MKV media files will be changed to MP4 format. 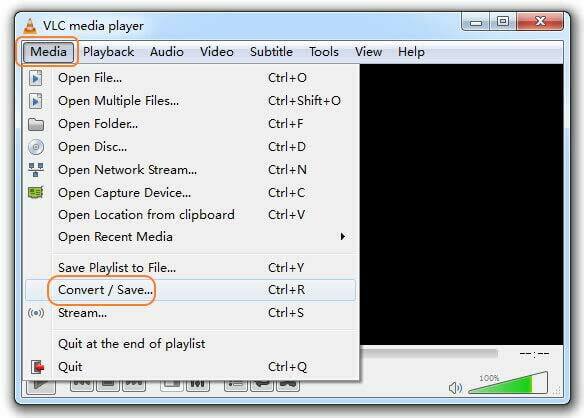 Click Convert All in the bottom-right to start converting multiple MKV video files to MP4 at one time. Note that turn on the High Speed Conversion console as pointed in the screenshot would speed up the whole MKV to MP4 conversion. Remux refers to transmit the information contained in Blu-ray or HD DVD disk without quality deterioration in both video and audio. 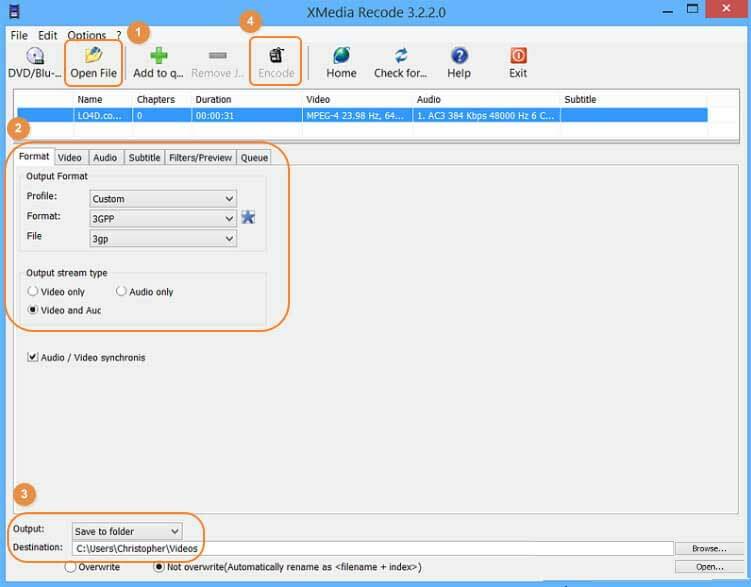 Below we'll show you how to remux MKV file to MP4 with Xmedia Recode. Step 1: Download and install Xmedia Recode on your computer, click Open File to load the MKV video you want to remux to MP4. Step 2: Go to Format tab to choose MP4 as output format. You can also switch to Video, Auido and other tabs to check the settings for the loaded MKV video. Step 3: Select Save to folder beside Output: and click Browse… to specify the destination. After that, hit Encode to start remuxing MKV to MP4. Mac users can benefit a lot from Wondershare UniConverter for Mac (originally Wondershare Video Converter Ultimate for Mac), the Mac version of the best MKV to MP4 converter mentioned above. It provides lossless conversion between MKV, MOV, MP4, VOB and over 1000 video/audio formats on Mac devices with OS X 10.7 or later, converts your MKV video to specific devices like iPhone, iMovie, Final Cut Pro, etc. to avoid any compatibility issues. Check to learn how to convert MKV to MP4 on Mac >. 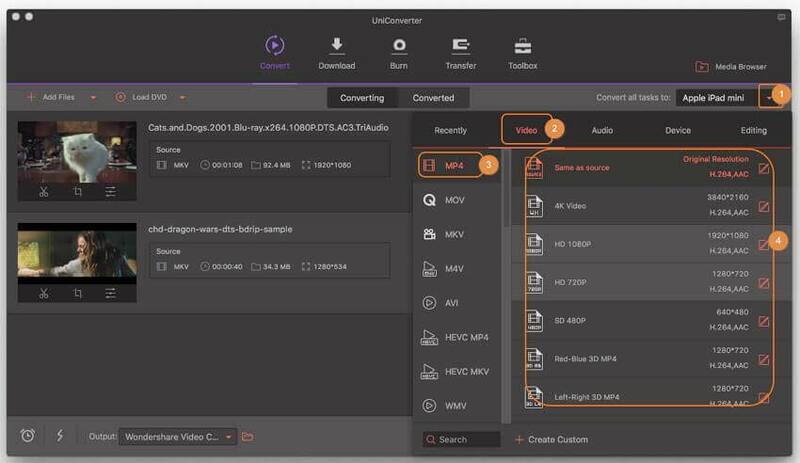 Mac Video Converter Pro is another all-in-one tool that converts video through exceptional format compatibility like MKV, WMV, AVI and ohter 320+ audio and video fromats. With it, you can enjoy QuickTime and iTunes while editing videos via iMovie or Final Cut Pro. However, the major deficiency of the Mac converter lies in it's too expensive for common users and there’s no discount provided when purchase online. iMedia Converter Deluxe is also a well-knowed MKV Video to MP4 Converter tool, which is capable of converting MKV files to any popular video formats like MP4, WMV, AVI, MOV and other 150+ output formats. Other than that, it provides you with the optimized output video settings for iPad, iPhone, Apple TV and many mobile phones, making it possible to convert MKV to iDevice-compatible in a click. Wondershare Free Video Converter is the best MKV to MP4 converter free, which functions almost the same as the steps to convert MKV to MP4 with Wondershare UniConverter (originally Wondershare Video Converter Ultimate). The main differences lie in some limits in the conversion and download. You can freely download the freeware via the download button below and use it anytime. Free convert MKV to MP4, MOV, AVI and 1000+ formats. Trim, crop, edit MKV video before MP4 conversion. Supported OS: Windows 10/8/7, Mac OS X 10.14, 10.13 - 10.6. 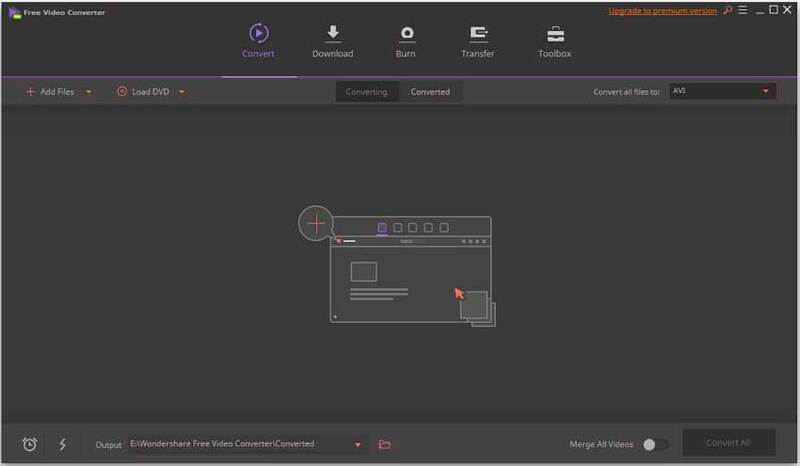 Click the Add Files button to import your target MKV videos to the free MKV to MP4 converter, or directly drag and drop them to the main interface. Hit the format icon in the upper-right corner to get the full list of output format, choose MP4 and the resolution under the Video tab. Click Convert All in the bottom-right corner to free convert MKV to MP4 right away. 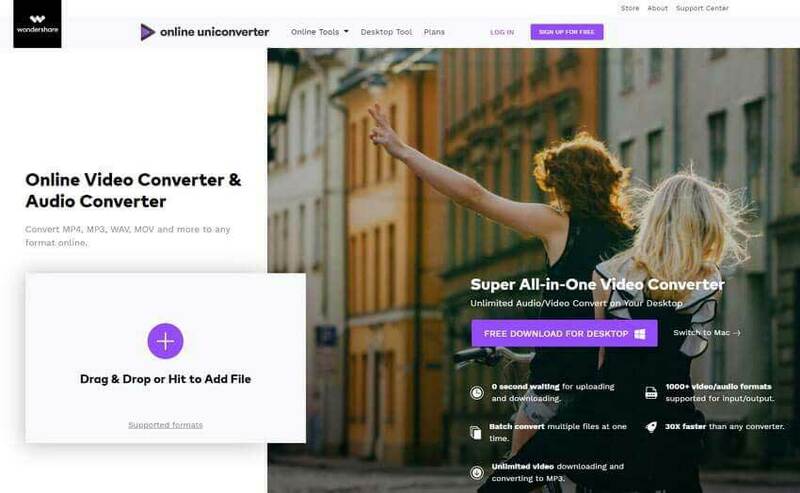 If you would like to convert MKV to MP4 online free, you can have a look at Online UniConverter (originally Media.io). It is accessible from any operative system and can be used from any browser. 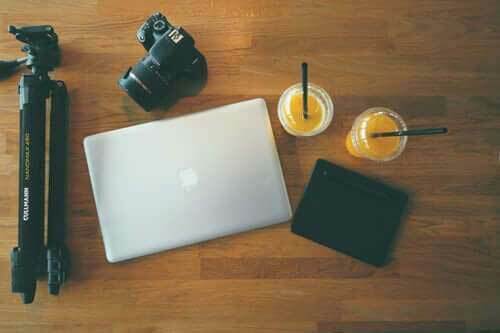 Other than that, Online UniConverter is compatible with various file formats and offers you information about the input and output formats with a brief but complete data. What's more, you can add two files to convert for each time with a maximum of 100MB files for conversion. 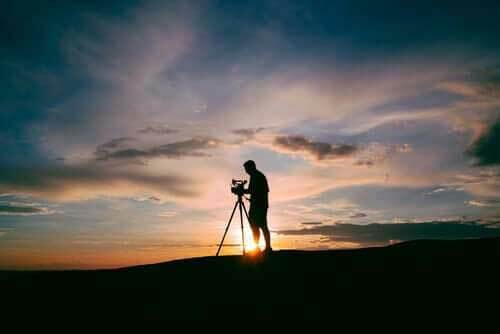 You can add you any video files, select the mp4 formart, then click the "Convert" button, just few minutes the video will be convert from mkv to mp4 online free. Very easy and fast! VLC Media Player, widely-known as cross-platform player for Windows/Mac/Linux/iOS/Android, is also excel in converting feature. 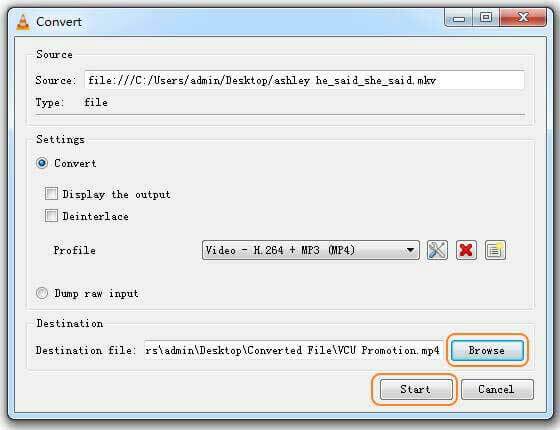 You can easily use VLC convert MKV to MP4 file within several clicks. Here's the overall guide on how to convert MKV file to MP4 using VLC. Install the latest VLC media player on your PC and run it afterwards, Click the Media tab and select Convert / Save... to get the Open Media window. Click Add... button to select local MKV files and hit Convert / Save button on the bottom to enter the Convert window. Then select Video - H.264 + MP3 (MP4) as out profile. Click Browse to customize the Destination where you want save the converted MP4 file. After that, click Start button at the bottom to start converting MKV to MP4 with VLC right away. FFmpeg is the free cross-platform converter that enables you to convert MKV to MP4 and other video formats. 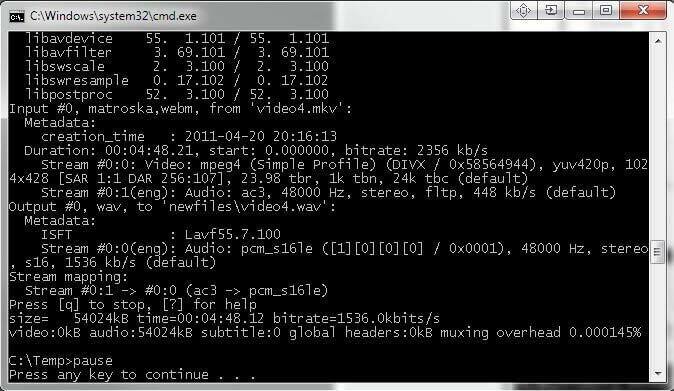 Unlike the common MKV to MP4 converting interface, there's no add file, output format button within Ffmpeg, all you need is to use the basic FFmpeg command to specify MKV to MP4 conversion. Step 1: Download FFmpeg on your computer first, then find the MKV video you want to convert to MP4. Step 3: After a while, you can get MKV converted to MP4 video lossless on PC. 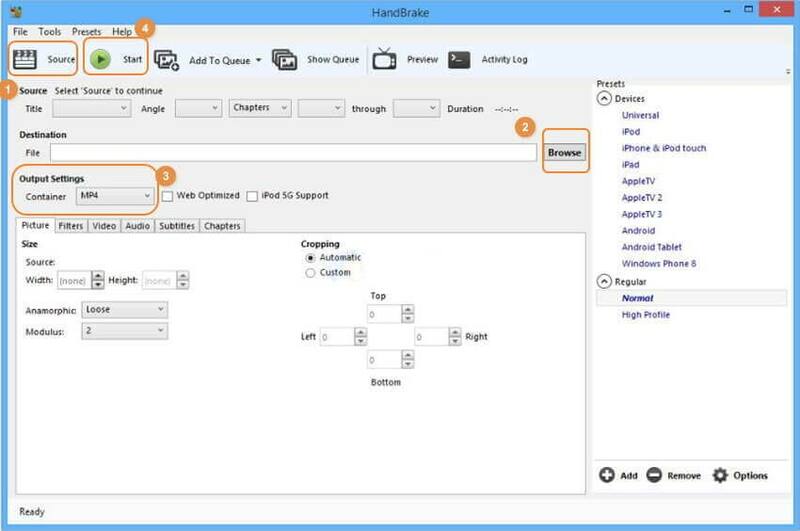 Handbrake is best free MKV to MP4 converter for converting video from nearly any format to two supported codecs MKV and MP4. It is free, so the output format is very limited, but you only want to convert to MP4 or MKV, this tool can basically meet your needs. Step 1: Launch the free MKV to MP4 converter, click the Source button on the toolbar and select Open File to open your MKV file. Step 2: Click Browse button under Destination to customize a folder where the converted .mp4 file will be saved to. Step 3: Go to Output Settings and choose MP4 as container, note HandBrake selects MP4 container format by default. Now just click the Start button in the top and HandBrake will convert your MKV video to MP4 file. OnlineVideoConverter.com (OVC) is a free online web application that allows you to convert MKV to MP4 online. It's also a mobile compatible MKV to MP4 converter app that allows you to convert MKV video with any Android, Apple and Windows device. Step 1: Choose a .mkv video your mobile device. Step 2: Select MP4 as the output format from the dropdown menu. Step 3: Click the Start button to start converting MKV to MP4. Description MKV file is generally “Matroska” files. 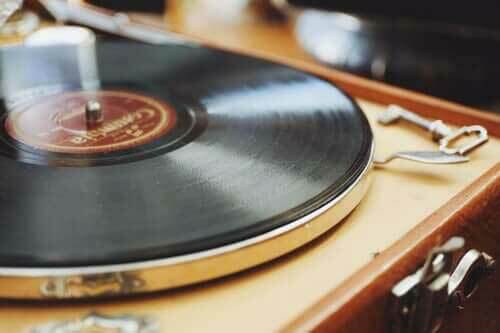 Those contains audio (movies) or video only. MKV file is an envelope for which there can be many audios, videos and subtitles screams, allowing the user to store a complete movie with subtitles. MP4 is a multimedia files extension, which is a container format that can store video, audio and subtitle data (as well as more depending on content). It became more popular science the stores like iTunes uses this container format, and it is used with iPod and PlayStation Portable (PSP) as built in support, MP4 files have become more popular. Does iTunes support MKV format? Although some famous players like VLC support it, iTunes doesn't. The latest iTunes 12 only accepts MOV, MP4 and M4V video format, so you cannot add MKV file to iTunes media library. Is there any way out to add MKV file to iTunes? To import MKV to iTunes, the easiest and fastest way is to convert MKV to iTunes compatible format. You can refer to above tutorials to try converting MKV to MP4 or MOV format. MKV is a free, open source container format that holds different types of video, audio, picture or subtitle tracks, making it unrecognizable by a common player. Here we'd recommend 2 omnipotent MKV player for both Windows and Mac users. 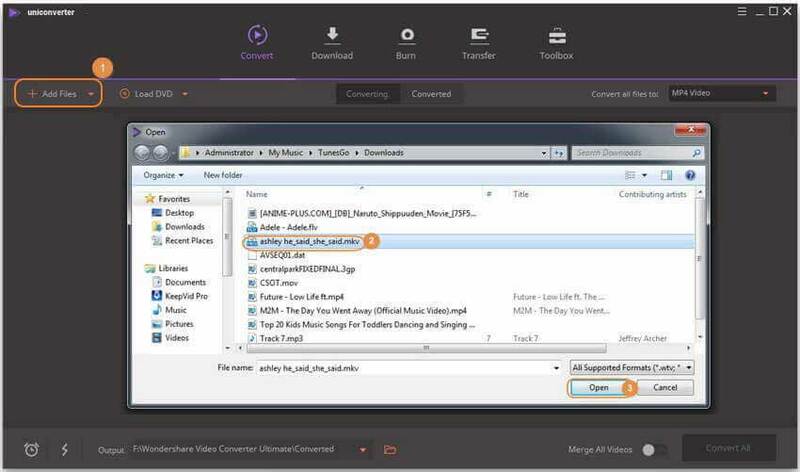 Wondershare UniConverter (originally Wondershare Video Converter Ultimate) also functions as a media player, which supports streaming any popular video/audio files within simple steps. Step 1: Drag and drop your MKV files to the Wondershare MKV player. Step 2: Move the mouse over the loaded MKV video thumbnail, you'd see a Play icon in the middle. Step 3: Click the Play icon and the MKV video will start playing immediately. VLC is a free and open source multi-platform multimedia player that plays MKV, WebM, MPEG-2, MPEG-4, H.264 and most codecs with no codec packs needed. To play MKV with VLC, you can either click Media > Open File... or directly drag MKV video to the player. 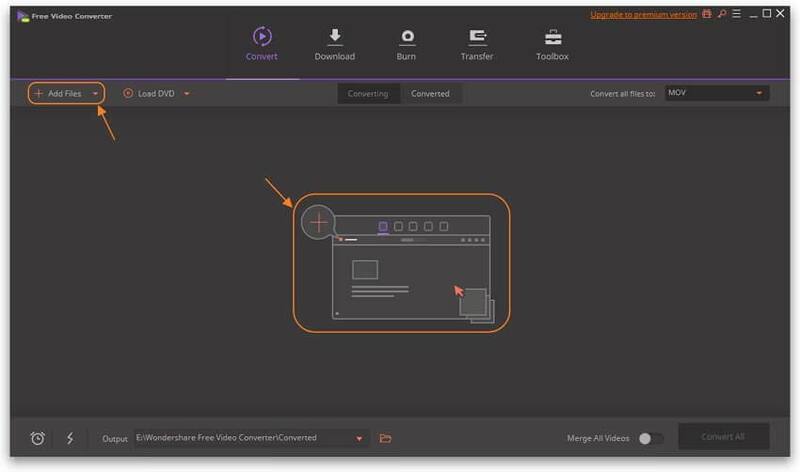 MakeMKV is a format converter or transcoder that converts your video into free and patents-unencumbered format that can be played everywhere in one click. In addition, MakeMKV streams decrypted video without intermediate conversion to wide range of players allowing you to watch Blu-ray and DVD discs with ease. Is there any free MakeMKV key? Yes, MakeMKV is free in beta currently and the beta key T-LW1uLLbYkVG@LRXgUx8eZlPSc5XtHUoGDg9My9NgOMC@2jNEQjvNY4zLxK8E0YduZT is valid till the end of July 2018. MKV Codec is a lightweight and powerful media interface which enables users to access and play MKV files. Where are free MKV codec packs? Combined Community Codec Pack(CCCP) is the best recommended MKV playback Codec Pack, which includes almost all you need to play .mkv (matroska video) and .mka (matroska audio) files. Once this codec pack installed, Classic Player or Windows Media Player can play video animation MKV format right away. 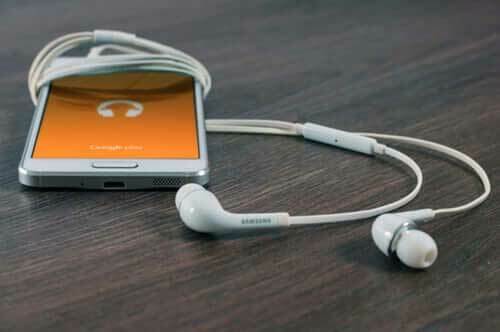 Here provides 3 methods to extract MP3 audio from MKV video for easy playback. The full guide will show you how to convert MKV to AVI on Mac and Windows. Read on to get the best MKV to DVD converter and learn how to play MKV with DVD player. 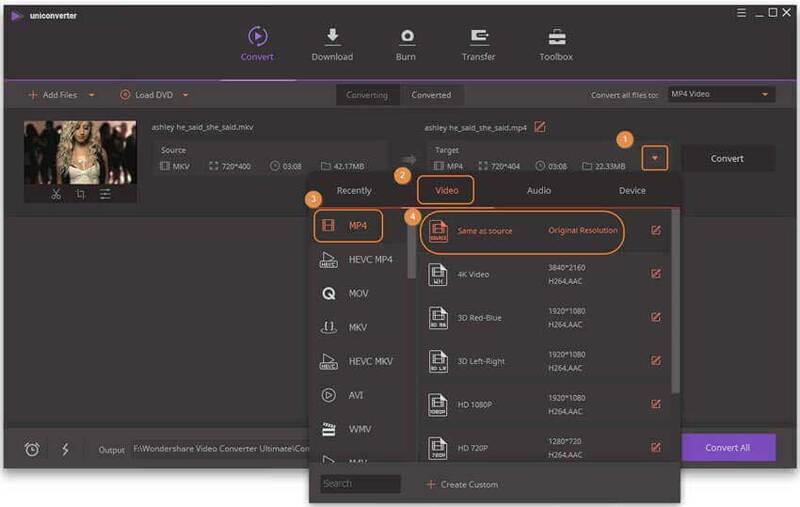 Follow the step-by-step tutorial to learn how to quickly convert MKV to MOV with ease.